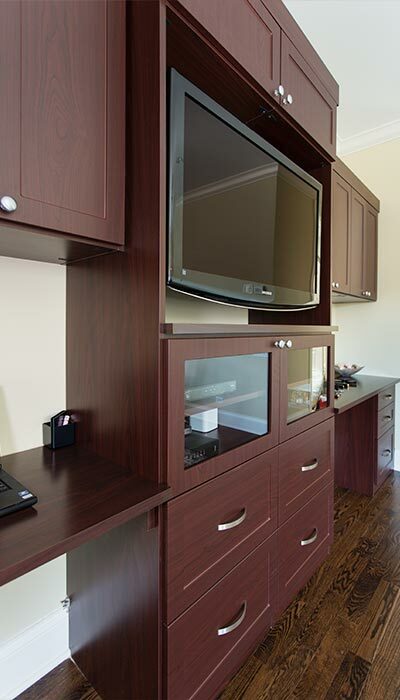 To start the process of customizing your own home office/guest room organizational system, browse our options and accessories section for ideas and inspiration. 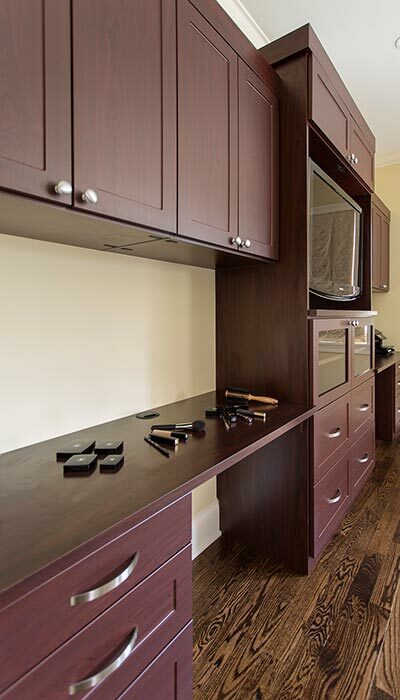 Then set up an appointment for a free in-home consultation with a member of our Chicago space saving design team. 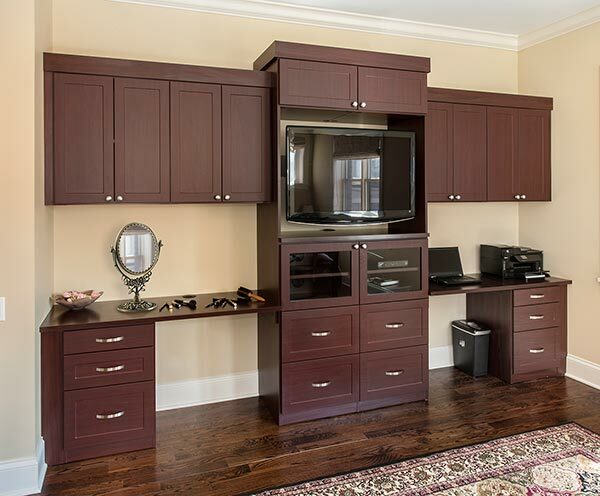 Or you can call us toll free at 800-4-CLOSET if you'd like to personally discuss your home office/guest room organization needs with one of our specialists. Closet Works Wins Top Shelf People's Choice Award! Project Description: A Triple-Purpose built-in, spanning an entire wall in client's master bedroom opposite the bed. The central section is the media center housing the TV, A/V components and Videos/DVD's in drawers (which can double as file drawers). The client followed the advice of having the TV mounted on an articulating arm, eliminating a "diorama-effect" that would've occurred had it been traditionally-mounted on the wall. The left side is the wife's vanity area while the right side is the husband's office area. They mirror each other but function differently. Visual interest is added by staggering flanking sections 6 inches lower than the middle and all are topped with a simple cleat crown, complimenting the Shaker-Mission Drawer/door face styles. People's Choice winners were chosen based on Facebook likes from industry peers and tallied as of the afternoon of April 13, 2015. Gerry Ayala for his "Master Dream Closet," "Wall Unit Wardrobe" and "Simplicity 2-Car Garage"
Lynn Casanova for her "Traditional Woman's Zen Space"
Lisa Lauren for her "Home Office and Wall Bed System"
Teri Magee for her "Downs Master Closet"
Chrissy Roellchen for "Master Closet Dream"
Sue Tinker for her "Up and Away Guest Room Office" and "Deluxe Locker Room"
Sue Trainor for her "Entertainment Unit"